Having a few Instagram tricks up your sleeve is always a great idea. If you’re just getting started with Instagram in 2018, we have a bunch of cool things to show you that will help give your account a kickstart. We’ve picked up these Instagram tricks over the years. Having grown our Instagram following from 0 to 17k strong (and growing!) here’s a list of tried and tested ways to help gain momentum. After you’ve signed up for Instagram, chosen an awesome username and added in a bio description the next thing you need to do is set up some cool Instagram Highlight covers. Most people go to add their highlight covers by uploading the graphics to their Instagram Stories directly. At the end of the day, it just ends up being 4 or more Instagram Stories posts that are plain old boring! A really handy Instagram trick to try is uploading your Instagram Highlight graphics to your Stories. Instead of ‘sharing to story’ choose ‘share to close friends’. 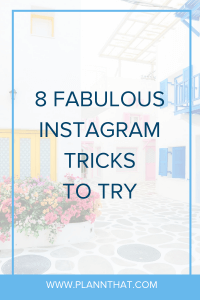 For a full in-depth guide to putting this Instagram trick to use, check out this blog. Here’s some inspiration to get you started. Well, take that love a step further and kickstart your account with this cool Instagram trick! When setting up your Instagram account it is definitely worthwhile knowing the steps that you will need to take if you want to get verified in the future. Click here to read our full breakdown of how you can set yourself up for success so that you can get verified! If you want to write engaging, interesting captions one of the first steps to success is making sure that you have easy-to-read captions. By adding line breaks or spaces in between sentences/paragraphs within a caption it’ll make your post easier to read and it’ll also make it look like your caption is shorter than it is. When someone is scrolling through Instagram and spots a big chunk of text in your caption, it can be really discouraging! Click here to discover how you can easily add line breaks to your captions (trust us, it’s SO EASY it is crazy). If you want to increase your Instagram Stories reach like a pro, this is the Instagram hack for you. Using the eyedrop tool in Instagram Stories, you can change the colour of your hashtags (text) to be the same as something in the background of the photo or video you’re uploading. Your hashtags will still work, but, when others are viewing your stories they won’t even know that they are there. For a full tutorial on this Instagram trick, click here. This Instagram trick is quite simple. For more details, take a peek at this blog! On Instagram Stories you need to share videos that are 15 seconds in length. It can get really annoying. Especially when you are trying to crop videos manually for stories. Or worse, trying to talk and stop… talk and stop… talk and stop…. UGH! Instead of doing that, use this Instagram trick. Easily and quickly crop Instagram Stories videos into 15-second snippets that you can upload one after the other. The trick? Download the CutStory app. It’s a lifesaver. And if you want to schedule your Instagram Stories once they’re perfectly edited? Download the Plann app to start scheduling Stories. If you want to customise the colours in your Instagram Stories, we so have the Instagram trick for you! You can use the eyedrop tool to customise the colours of your text backgrounds, pens and other drawing tools in the Stories dashboard. Here is a full guide to walk you through customising! So will you be trying any of these Instagram Tricks? Phew! Now that you’ve got all these Instagram tricks under your belt, you’ll be unstoppable on the ‘gram. Have a flipp’n awesome day. Don’t forget, if you want to grow your Instagram account like a pro, download Plann and give it a whirl today.